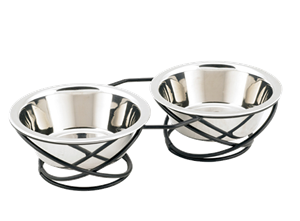 Beautiful iron double feeder featuring the one-of-a-kind double-riser stand, comes with two stainless steel drop-in bowls and a sturdy, wrought iron double-riser to hold the bowls. The diner features a durable base, which keeps your home clean and quiet from any accidents that occur when your pet’s bowl moves or spills. Made in India.